A Francis Bacon painting of a man and his reflection brought in $44.9m at Sotheby's in New York last night, capping a week of breathtaking sales in the luxury art market. Bacon's "Figure Writing Reflected in a Mirror" was one of the three pillars at the Manhattan auction and had a pre-sale estimate of $30m to $40m. 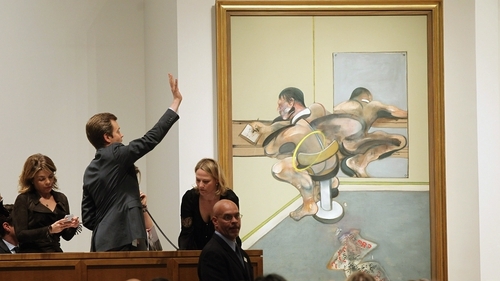 After slow bidding, the hammer finally fell at $40m, to which commissions were added to make the final price. In 2001, the reassembled cramped studio of Bacon went on display at the Hugh Lane Gallery in Dublin. A Roy Lichtenstein close up of a blonde woman titled "Sleeping Girl", executed in the pop art king's typical cartoon style, also fetched $44.9m, including commission, a new record for Lichtenstein. "She is beautiful," auctioneer Tobias Meyer said of the figure in the painting. Mr Meyer returned to that word after the auction, telling journalists: "The high end of the market performs beautifully." Even as world equity markets and governments across the West remain jittery over their financial future, the international art market is in giddy form, leaving the fallout from the 2008 stock markets crash a distant memory. Yesterday's auction brought in a total of $266.6m, double the $128m from the same May contemporary sale last year, Sotheby's said. "That's a great indication for where the contemporary art market is moving," Alex Rotter, head of contemporary art at Sotheby's in New York, noted. However, even Sotheby's couldn't match the fireworks at rival Christie's on Tuesday, when records fell in droves and Mark Rothko's "Orange, red, yellow" sold for $86.9m, becoming the most expensive contemporary work ever auctioned. One of the biggest draws at Sotheby's was billed as Andy Warhol's "Double Elvis," which pictures the rock and roll legend as a cowboy gunslinger. It was estimated to go for between $30m and $50m and ended up selling for a respectable, if muted $37m - nowhere near the Warhol record of $71.7m. A string of unsold works yesterday added to the slightly damper accent of the evening when compared to Christie's, which saw 14 artists' records broken. Also, at Christie's, the night's total takings of $388.5 million were the highest ever for a contemporary art auction, a record last set in 2007. But Sotheby's has its own record to celebrate from last week's Impressionist and modern sale. The auction house sold the only privately-owned version of Edvard Munch's "The Scream" - one of the most recognisable paintings in history - for $119.9m, the most ever paid for any work at public auction.